Scientists in China have developed a quick and easy procedure for preparing 3D graphene in water, enhancing graphene's properties so that it can be used in supercapacitors, to store hydrogen and as a catalyst support. Graphene, a single sheet of carbon atoms patterned in a honeycomb lattice can, via self-assembly, form 1D and 2D structures that have many potential applications. 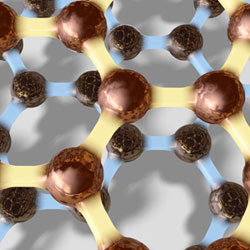 However, the graphene obtained is usually small, which limits its use as a functional material. 3D microporous and mesoporous carbon materials (hydrogels and aerogels) are lightweight; have high porosities and storage capacities; large surface areas; high electrical conductivity and thermal stability. Preparing such structures is challenging under mild conditions and current methods are not scalable or cost efficient. Lifeng Yan and colleagues at the University of Science and Technology of China, Heifei, have prepared 3D graphene structures by self-assembly from graphene oxide using mild chemical reduction in water at 95 degrees Celsius at atmospheric pressure without stirring. The graphene shapes were controlled by using reactor vessels of differing shapes. The team were able to produce cylinder-, pear- and sphere-like shapes. 'The process is quite simple - any macroscopic 3D graphene shapes can be prepared at room temperature and pressure,' explains Yan. In tests, the team found that the materials had high electrical conductivity, and high mechanical and thermal stability. The values for specific capacitance were similar to graphene hydrogels prepared by a hydrothermal method. The materials' mechanical stability, measured by a compression test, was comparable to chemically cross-linked polymer hydrogels. Yan's team plans to investigate the applications of their materials in super-capacitance, biosensors and catalysis, as well as preparing different types of novel 3D graphene composites. 'These macroscopic multi-pore materials will be very interesting if they can be used for reducing greenhouse gases by developing new catalysts,' says Xiaobo He, an expert in graphene materials at Louisiana State University, US.